Detached, neat and very well-kept holiday home with a small garden and raised terrace with garden furniture and BBQ. From the terrace you have wonderful views of the neighboring vineyard. Next to the house is a large lawn. Here, children have lots of space to play and to play football. Ca. 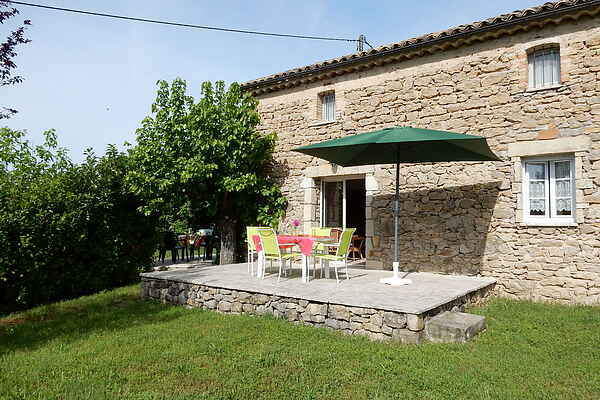 30 m from the house you can use the fenced pool of the friendly owners. This holiday home was once an old barn and it has undergone a complete renovation and meets all the requirements and comforts of today. It is located in a small, quiet neighborhood just outside the town of Uzer, about 16 km south of the lively and vibrant city of Aubenas. This rugged area is packed with beautiful things to visit. Everything is there: lovely views from the beautiful river Ardèche, with its many opportunities for canoeing and swimming. Picturesque ancient villages like Balazuc (4 km) or Vogüé (12 km). The biggest attractions are of course the Gorges de l'Ardèche and the famous Pont d'Arc (25 km), a natural \"bridge\" over the river Ardèche.